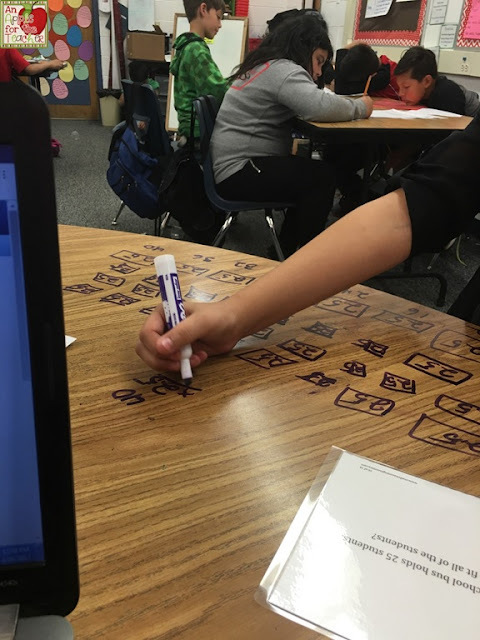 Do you ever do something in your classroom that works REALLY well, and then somehow forget about it completely? Well, that is something that happened to me with the Math Reasoning Inventory. 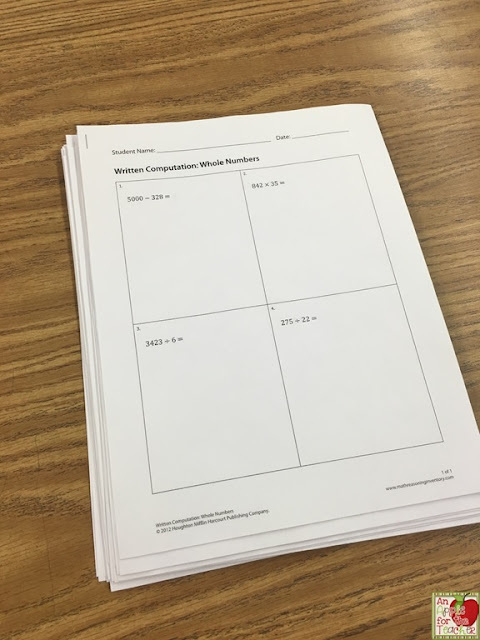 I used it with my 7th grade math students and was highly successful, but never thought about using it with my elementary students until last year. This year I will be starting the year with the assessments right away, and I think you should too! What is the Math Reasoning Inventory? The Math Reasoning Inventory is a free on-line assessment tool that helps you learn about your students' numerical reasoning. It was developed by math expert Marilyn Burns. 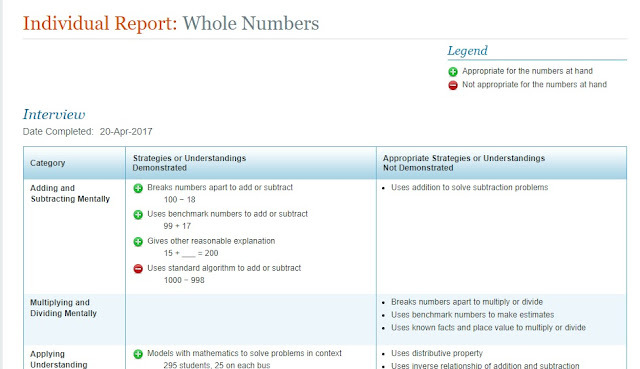 The site says that it is appropriate for grades 5 and up, but I have used it with my 4th graders, and I think you could successfully use the whole numbers inventory in 3rd grade. 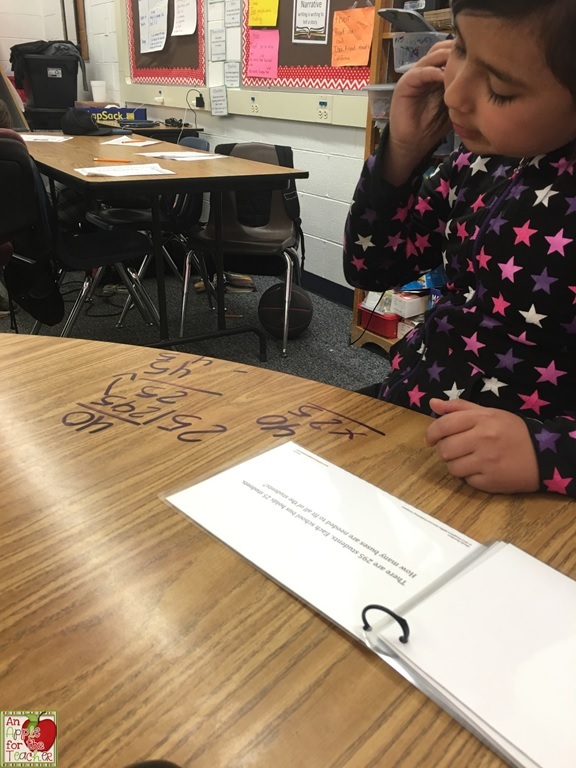 If you teach a lower grade, I would still give it a look, because I think you could implement a similar process that would be so powerful for understanding what your students are thinking in math. 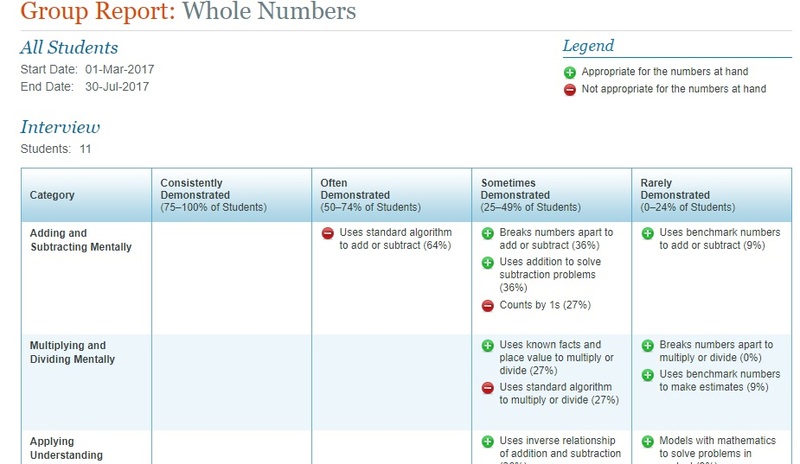 There are three assessments: whole numbers, fractions, and decimals. 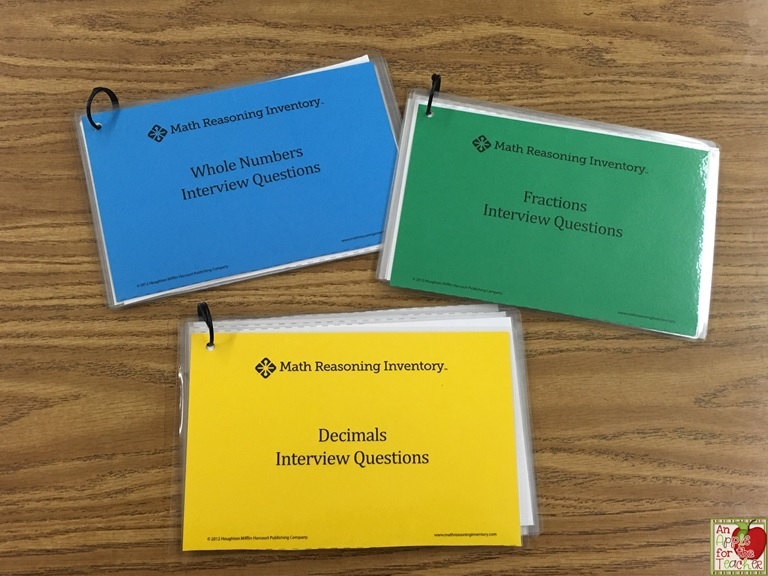 Each section contains a 4 question written test and an individual face to face interview where students are asked to explain how they came up with the answer. I printed each of these from the website on card stock and laminated them for durability. I used colored card stock to print out the covers so I can find them easily. I placed the cards on a binder ring for storage and ease of use. I have the students take the written assessment as a whole group assignment. 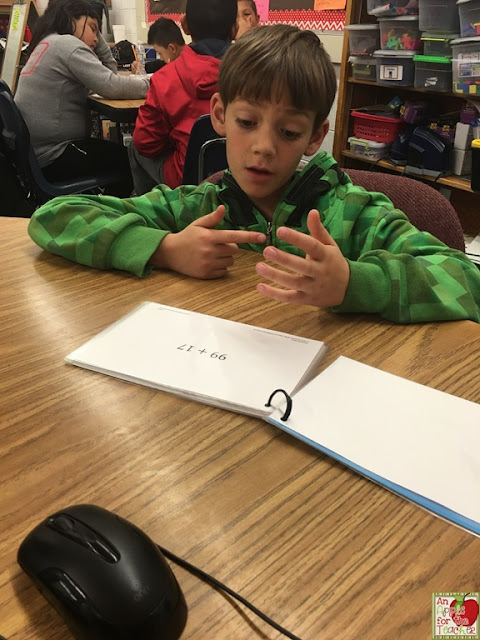 I break down the interview process similarly to reading assessments with about 4 students per day. Most of the questions are asked as mental math problems, but one or two have the students use pen and pencil (or in my case dry erase markers) to solve. The program has a section to keep track of what types of errors students make and a place to make notes about what you observe. Once you have assessed your students, reports are generated for both individuals and whole group. 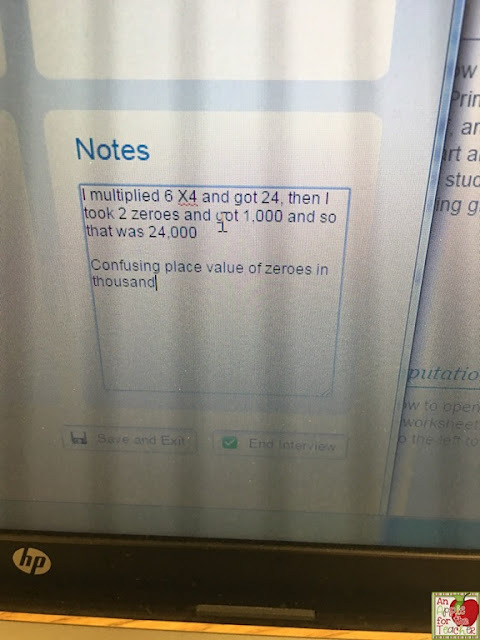 Aside from the data provided from the computer, I was able to observe things about my students' thinking that I might not have otherwise observed. 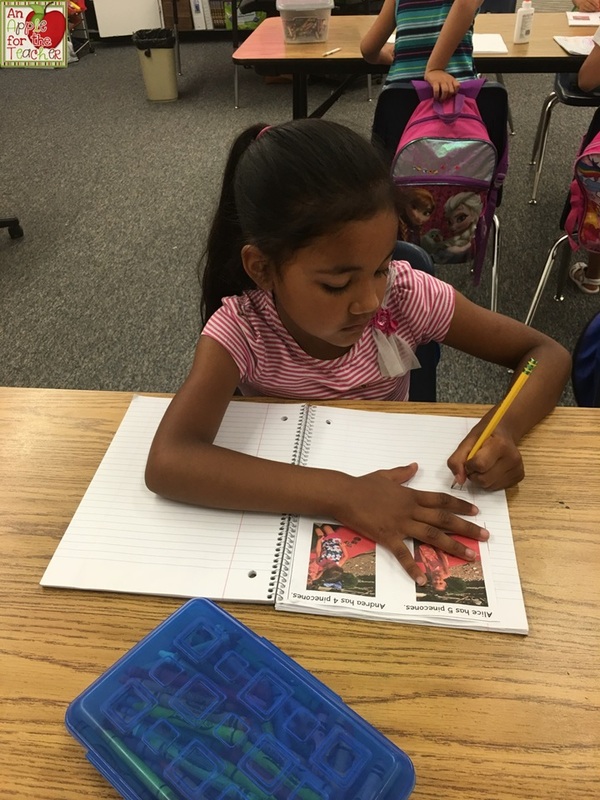 I saw some great results this Spring after using for just a few short months, I can't wait to see the results next Spring after using the assessments (and lessons developed from the results) from the beginning of the year. 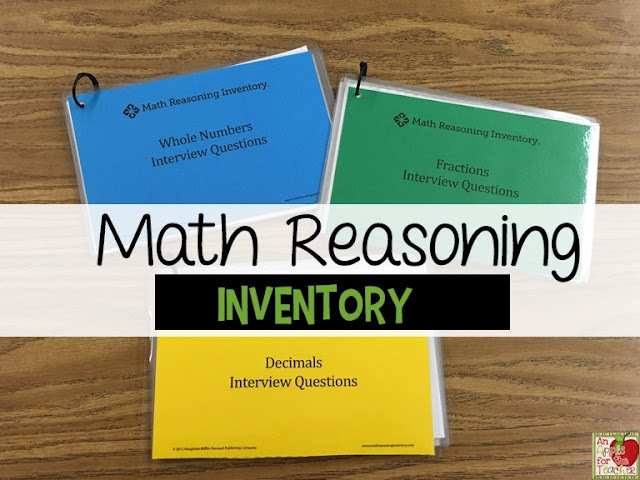 If you decide to try out the math inventory, I would love to hear how it goes! Leave a comment below or tag me on Twitter or Instagram! I will also be sharing some other assessments I use in my classroom in the next few weeks, so make sure to check them out! If you like this post and don't want to miss out on future posts, please subscribe to my newsletter. Can you believe it is almost August already?!? 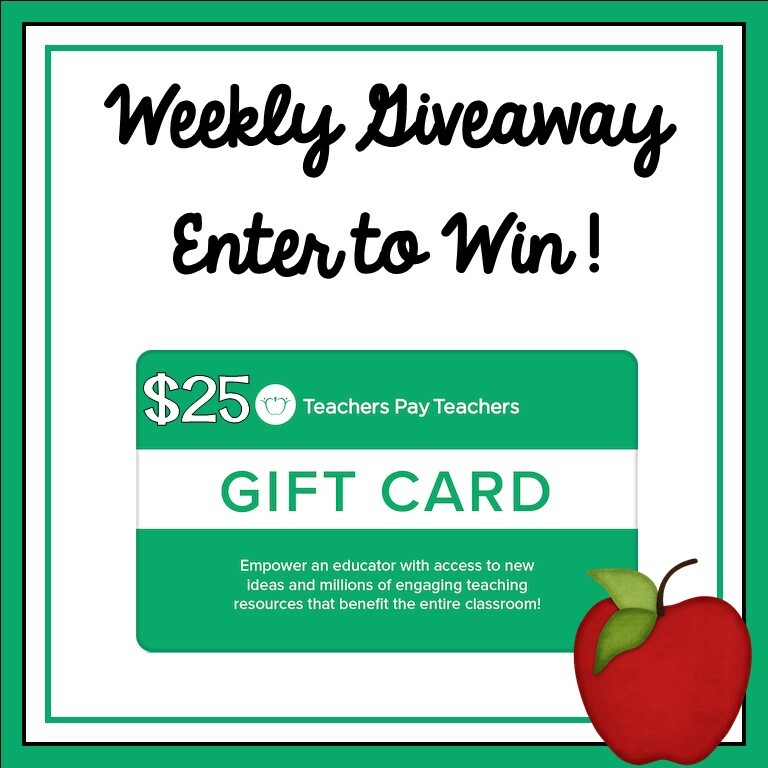 August typically means back to school for most of us in the United States, and I bet a $25 Teachers pay Teachers gift card would help you get ready! Luckily for you, it is time for our weekly giveaway! Co-hosts: An Apple for the Teacher, It's a Teacher Thing, LIVIN' IN A VAN DOWN BY THE RIVER, Kathryn Watts, Dee Bibb - Teaching at the Beach, Globe Trottin' Kids, Pitner's Potpourri, It's Kinder Time, Growing Grade by Grade, and The Dennis Crew. Rules: Use the Rafflecopter to enter. Giveaway ends 8/7/17 and is open worldwide. 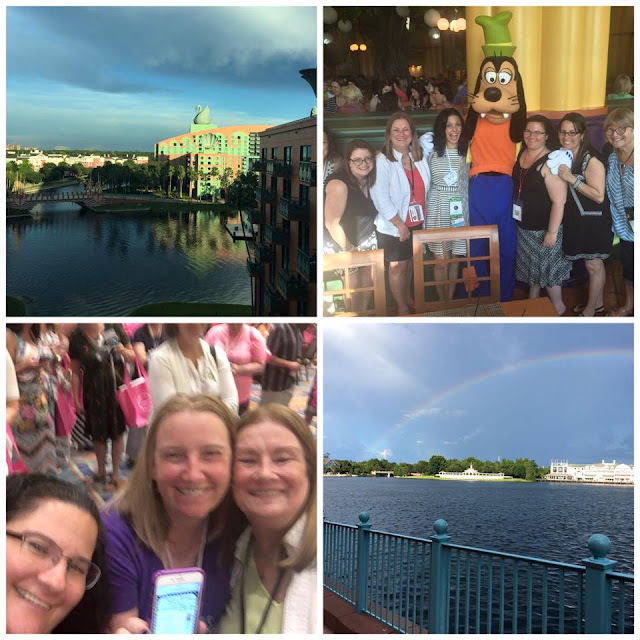 I have just returned from the TpT conference, and I had an AMAZING time with my TpT buddies! Kathleen from A Plus Kids, Julie from Teacher Ms. H, ME, Mercedes from Surfin' to Success, and Shelby from Wiggling Scholars. Not pictured is Nichole from The Craft of Teaching who was getting her groove on on the dance floor. Everything is better with friends, including our weekly giveaways which I could not do without the help from my amazing friends! Co-hosts: An Apple for the Teacher, LIVIN' IN A VAN DOWN BY THE RIVER, Kathryn Watts, It's Kinder Time, "Dee Bibb - Teaching at the Beach",Globe Trottin' Kids, Teaching Second Grade, Jackie Crews, and Brynn's Teacher Bag. Rules: Use the Rafflecopter to enter. Giveaway ends 7/31/17 and is open worldwide. My students have always LOVED when I use their names in math problems. They always get excited, and the engagement really increases. 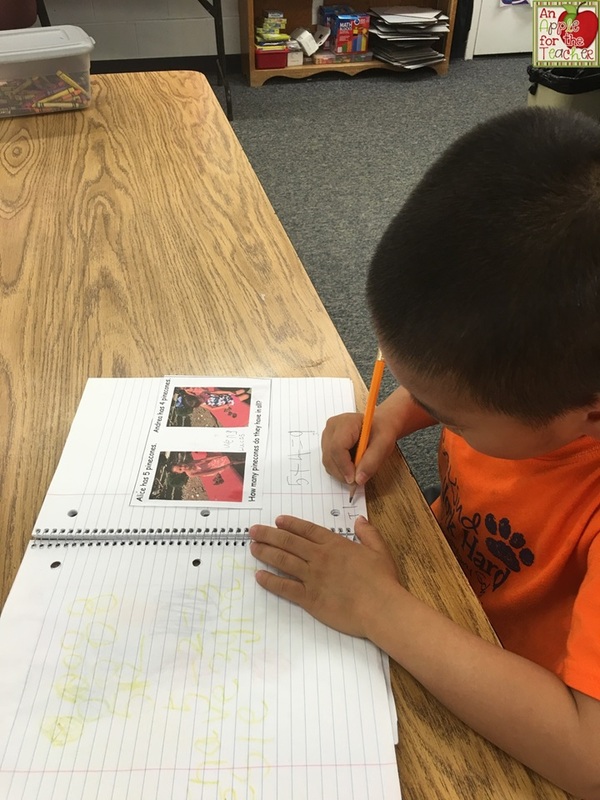 This summer I have been teaching summer school. I decided to take the personalization one step further with pictures. My littles had an obsession with pine cones (although they called them acorns for some reason - LOL!). 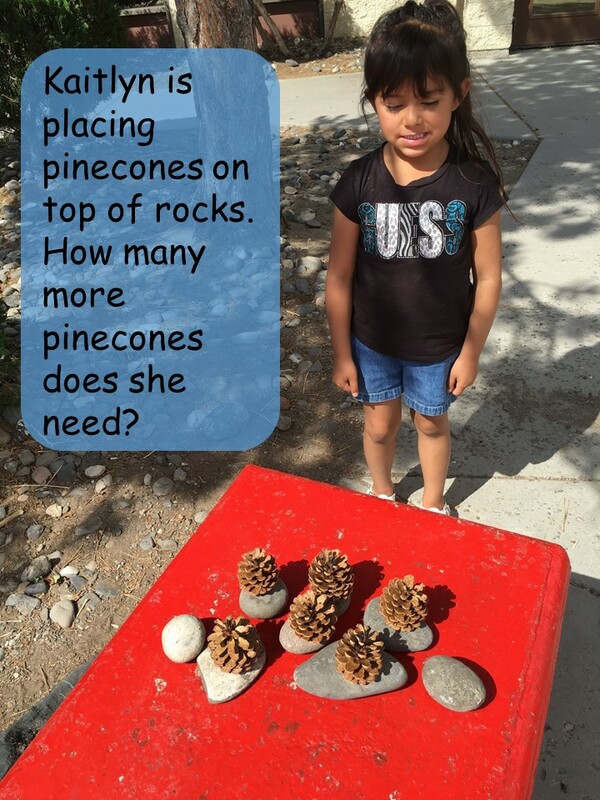 So, I took them outside to play with the pine cones (and to practice some math skills). 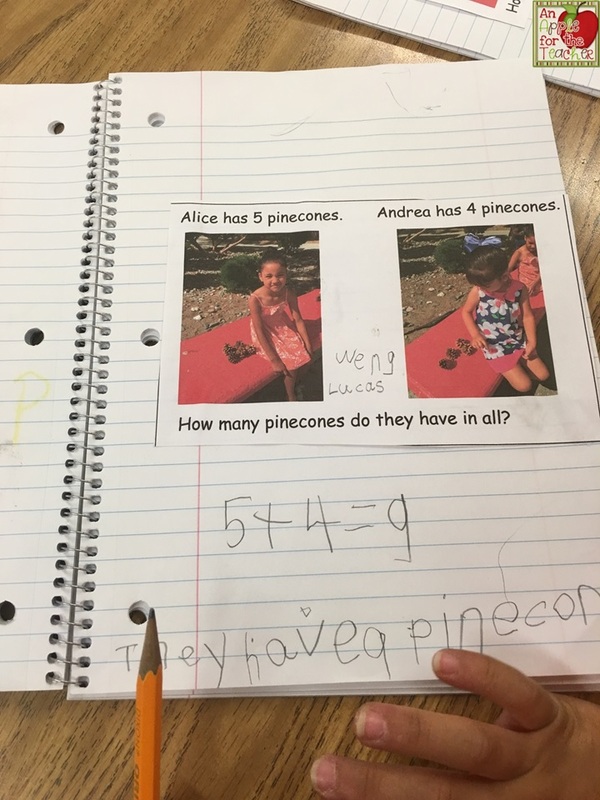 I took pictures of them while we were outside and created math prompts with them. Instant engagement! They were so excited to see their faces in their math journals! 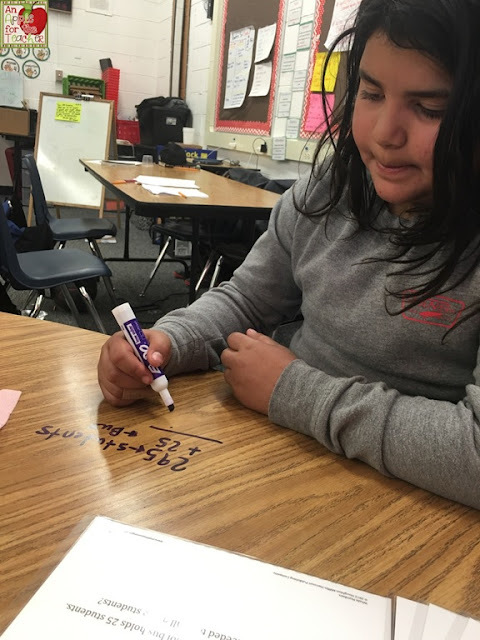 Have you ever personalized your math problems? 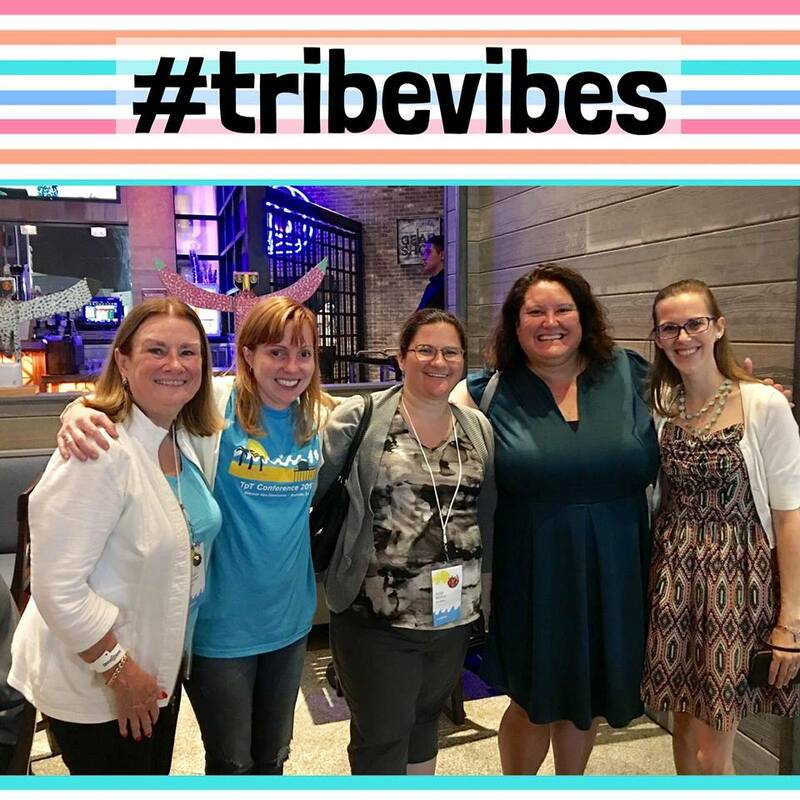 I am at the Teachers pay Teachers conference this week, and I am so excited to see many of my friends that I only get to see once a year! But... 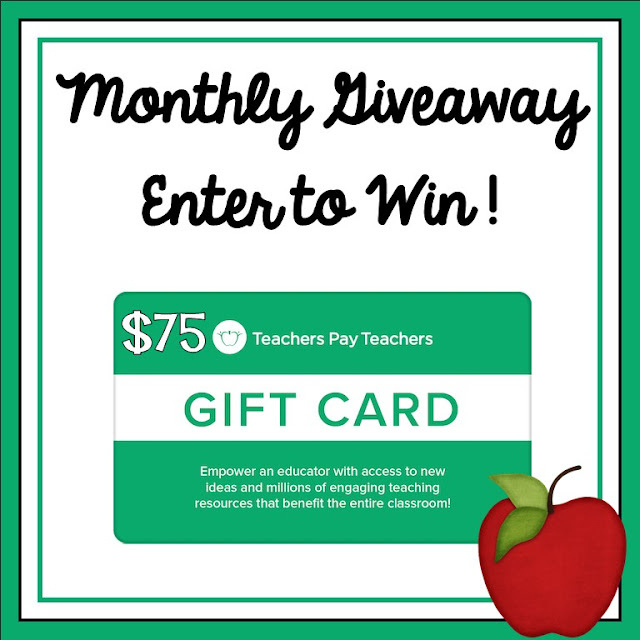 I don't want to be the only one having fun, so be sure to enter to win a Teachers pay Teachers gift card so you can have some TpT fun too! Co-hosts: An Apple for the Teacher, LIVIN' IN A VAN DOWN BY THE RIVER, Growing Grade by Grade, "Dee Bibb - Teaching at the Beach", It Happened in 3rd, and Lockwood's Little Learners. Rules: Use the Rafflecopter to enter. Giveaway ends 7/24/17 and is open worldwide. July is already one third of the way over - this summer is just flying by! I know that means that many of you are headed back to school soon. We go back late this year - August 31st. No matter when you go back to school, a Teachers pay Teachers gift card is bound to help you out! Enter below! Co-hosts: An Apple for the Teacher, LIVIN' IN A VAN DOWN BY THE RIVER, "Dee Bibb - Teaching at the Beach", Jackie Crews, Globe Trottin' Kids, That's Appsolutely Genius, and Brittani Black. Rules: Use the Rafflecopter to enter. Giveaway ends 7/17/17 and is open worldwide. Co-hosts: An Apple for the Teacher, A Plus Kids, Reading and Writing Redhead, PreK Kristin, Mickey's Place, The Chocolate Teacher, Heart 2 Heart Teaching, Leah Popinski, Momma with a Teaching Mission, MM Bilingual, Teaching Ideas For Those Who Love Teaching, A Library and Garden, Simone, Planet Happy Smiles, Teacher Gameroom, Patty Rutenbar, Paula's Preschool and Kindergarten, Teaching Where You're Called, Mrs Hansens Helpfuls, Teacher Jeanell, Southern Drawl, KB3Teach, Jackie Crews, and Peas in a Pod. Rules: Use the Rafflecopter to enter. Giveaway ends 7/13/17 and is open worldwide. Every week I team up with a group of amazing Teachers pay Teachers sellers to host this giveaway of a $25 Teachers pay Teachers gift card! Will you be the winner this week? Co-hosts: An Apple for the Teacher, LIVIN' IN A VAN DOWN BY THE RIVER, "Dee Bibb - Teaching at the Beach", and Ms. K.